Navajo Jewelry - When and how the Navajo acquired the art of working metals is unknown but there are reasons for supposing that it was introduced among them, or at least more developed and improved upon by them, since the time they have occupied their present country. According to the sayings of some of the old Navajo Silversmiths of the tribe, the art of working Silver was introduced among them by the Mexicans/Spaniards about the middle of the nineteenth century, when a Navajo blacksmith, known by his own people as Atsidi Sani, or the old smith, and by the Mexicans as Herrero, or the smith, first learned the art from a Mexican Silversmith named Cassilio, who is said to have still been living in 1872-1873. It is believed that it was Atsidi Sani the was the first Navajo Indian to make Navajo Jewelry aproximately 1865. Lieut. James H Simpson, who accompanied an expedition into the heart of the Navajo country in 1849, and who gives in his report good descriptions of the country and people as they then were, mentions their peach orchards, farms, herds of ponies, flocks of sheep their beautiful waterproof blankets. etc., but has nothing to say about their Navajo Jewelry. In The Navajo, Ruth Underhill suggests, When we look for the origin of Navajo Jewelry or Silverwork, perhaps this craft developed under stress of hunger and may point to an early inspiration. Prior to the coming of the Spaniards, the Native Americans of the Southwest had no metal or livestock. The Navajos were undoubtedly envious of the strange new enemies who rode horses and had guns, bridle bits, tools, even Silver-decorated bridles and saddles. And, even though many of these items were procured through raids, the Dine' must have wished for a steady and reliable source. Learning metalsmithing, however, would have required tools and materials the Navajos did not have, and the Spaniards were sworn enemies. Contact was far too brief to allow even the quick-learning Dine' to acquire Spanish skills. At what time the Navajos actually learned to work metal is debatable. Some say it happened before the Long Walk, while others differ, but it is generally accepted that one of the first blacksmiths was Atsidi Sani (Old Smith), or Herrera Delgadito (Little Slim Ironworker), as he was known by the Mexicans. Margery Bedinger states in Indian Silver that "In about 1850 [Atsidi Sani] journeyed south to a Mexican settlement near Mount Taylor... and persuaded one of the inhabitants, Nakai Tsosi (Thin Mexican), to teach him how to form the black metal," this was iron or steel. If not the first Navajo blacksmith, Atsidi Sani was the most prominent, and probably the most proficient, of that era. Noted for making knives and bridle bits, he would teach his craft to many Navajos, including some of the men at Bosque Redondo. Most of the early metalwork was utilitarian, but buttons, rings, earrings, belt pieces strung on leather, and a few bridle ornaments were also made. Multiple bracelets of twisted metal were often worn on one arm; others, hammered out of copper or brass, had lightly scratched, simple designs. Navajos had worn Silver ornaments and sported Silver bridle decoration for at least fifty years, but those articles were of Spanish origin, either traded or stolen from Mexicans, or taken as spoils of war from Utes or Comanches. In 1853 (eleven years prior to incarceration at Bosque Redondo), Indian Agent Henry Dodge moved into a newly built stone house near Fort Defiance, made friends with the Navajos, and eventually married a Navajo woman. It is also reported that he brought along a blacksmith and a Mexican Silversmith. Many years later, the agent's aged son, Chee Dodge, would say that "Old Smith (Atsidi Sani) came to the agency to look on and learned some things." The supposition is that Atsidi Sani learned or perhaps improved his skills by watching these men, but whether his skills included Silverwork is unknown. Those years were particularly chaotic; raiding and clashes with other tribes were at their height. Therefore, the times were not particularly conducive to learning a new craft, and Silver would have been difficult to obtain. Atsidi Sani's great-nephew, Grey Moustache, is quoted as saying, "It was not until the Navajo came back (from Bosque Redondo) that he (Atsidi Sani) learned to make Silver Jewelry," Navajo Jewelry. And Chee Dodge would add that "The Navajo didn't make any Silver of their own while they were at Fort Sumner. How could they? They were locked up there like sheep in a corral. They had only a very little Silver in those days, which they bought from the Mexicans." Several newspaper articles published in New Mexico during those years made claims of Navajo Silverwork or Navajo Jewelry. "Navajos at Fort Sumner are skilled enough to make good bridle bits and other articles of horse equipage in iron and Silver," one reported. "Amongst the chiefs now on this reservation, many are dressed in comfortable and even elegant style, in black cloth and buckskin, well-fitted to their bodies and ornamented with Silver buttons of their own execution and design." The Silver buttons were most assuredly not of Navajo design or Navajo Jewelry; they had been procured from Mexicans for years. Furthermore, this entire account seems doubtful considering the deplorable state of Navajo life during exile. One might suspect that the editors, possibly influenced by corrupt politicians who were noted for their greed-and-graft mentality, were trying to make living conditions appear much better than they were. Historic photographs show the Bosque Redondo Navajos poorly dressed in cotton clothing or wrapped in blankets against the bitter cold. It is unlikely that even "the chiefs" mentioned in the newspaper article would have dressed as described. If any did, they must have been the exception, and any Silver ornaments they possessed were probably trade goods. It seems much more probable that the Navajos learned to work Silver of make Navajo Jewelry soon after they resettled in their homeland. Atsidi Sani is generally considered the founder of the Silver craft, but whether he learned it from the same Mexican who taught him metalwork or from another Mexican friend is unconfirmed. However, his first students to make Navajo Jewelry were his four sons who, in turn, taught others. With peaceful conditions, Mexican smiths began traveling onto the reservation to trade their Silver for Navajo livestock. As the Silversmith fashioned a piece, the Navajo who ordered it would certainly have observed and perhaps even assisted by working the bellows. Considering their propensity for acquiring new skills easily, the Navajos must have recognized this as an excellent opportunity to learn to craft their own Silver ornaments. 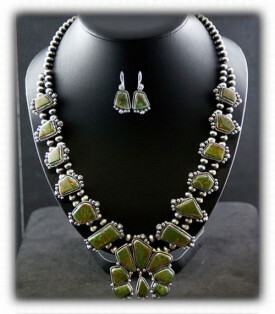 It has been recorded that they were casting Navajo Jewelry as early as 1865. Silver coins, acquired from soldiers at Fort Defiance and Fort Wingate, were melted down, then poured into hand-carved molds to create a particular design or a simple ingot, which was then cooled, hammered into a thin sheet of Silver, and trimmed to the proper shape. The Navajo Jewelry learning process, however, was still gaining momentum. In 1884 John Lorenzo Hubbell (the much-admired Don Lorenzo of Hubbell Trading Post at Ganado) and his partner, C. N. Cotton, hired Mexican smiths to teach Silversmithing to the Navajos, and began furnishing some of the coins used to fashion the Silver ornaments and Navajo Jewelry. The first Navajo Silverwork was rather crude and quite heavy, but it showed a lot of promise. Designs were symmetrical even though smiths had no precision implements; in fact, they had few tools of any kind, often just a hammer, some files, and scissors or metal snips. Washington Matthews, a young army surgeon from Fort Wingate and the most noted Navajo authority of the 1880s, recorded the tools and techniques used by the smiths to make Navajo Jewelry. For anvils they acquired pieces of train rail, kingpins from wagons, any old pieces of iron large enough, hard stones, or tree stumps. Forges were made of mud or sandstone, the bellows from goatskin bags, and crucibles from anything that worked stones with small hollows, tumbler-sized pottery pieces made especially for that purpose, or iron pipes with one end flattened, turned up, and sealed. A semicircle or V-shaped groove was sometimes cut into anvils for shaping bracelets; the first molds were made from baked clay and discarded after a time. Later molds were carved from iron, wood, or soft sandstone, which was greased with mutton tallow to prevent sticking. Some of the first Silver or Navajo Jewelry items made by Navajo's were the buttons they had previously obtained from Mexicans. Men's trousers, jackets, leather pouches, bridles, saddles, gun scabbards, ketohs, or bow guards, the wide leather bands worn on the left wrist to protect from the bowstring's recoil. and belts were adorned with these Silver ornaments. They also decorated the moccasins and leggings of both sexes, and women's blouses had rows of them at the neck, across the shoulder, down the front, and running the length of both sleeves. Many Navajo Jewelry bracelets were nothing more than narrow bands with notches cut on either side; others were made of twisted wire or plain Silver with simple designs scratched in with a file. Conchas for belts were decorated with scalloped edges, punched holes, and incised and stamped designs. Rings were simple decorated bands of Silver; earrings were large loops that passed through pierced ears. Silver replaced the tin decorations on ketohs. Small Silver canteen-shaped containers for carrying tobacco were copied from rawhide ones carried by Mexicans. The headbands of bridles were covered with wide strips of Silver that almost concealed the leather. Normally, a Silver concha was added on either side, and a crescent-shaped ornament called a naja hung from the forehead strap. Najas, adapted from those used by the Spaniards, were worn on bead necklaces as well, and were often interchangeable with those on bridles. Matthews also recorded the bead-making process which began around 1870. By this time, the smiths were apparently turning from U.S. coins to pesos for their Silver; Matthews mentions that Mexican Silver dollars were used to form the beads. A peso was pounded into the desired thickness; then a disk large enough to make half a bead was cut out with scissors. It was trimmed and used as a pattern for the others. Half-circles were formed with a mold and die; the pieces were strung on a stout wire in pairs forming full circles and fastened tightly together. A mixture of borax, saliva, and Silver was applied to the seams of all the beads; they were put into the fire and all soldered at one time. After cooling, the beads were blanched, filed, and polished. In Navajo Jewelery, Bead necklaces had become very popular by the 1900s. According to G. W. James in Indians of the Painted Desert Region, "scarcely a man or woman of any standing in the tribe does not possess a home-manufactured necklace of Silver beads." The "squash blossom" necklace was probably introduced around the turn of the century. It was not mentioned by Matthews in the 1880s, but was included in the Franciscan Father's Ethnologic Dictionary of 1910: "When arranged upon a string or thong, each necklace contains from fifty to sixty the finer, smaller specimens often number as many as one hundred beads. Usually they have a large crescent-shaped pendant in the front center, and in the lower half of the strand small Silver crosses, and other flowerlike ornaments are strung after every second or third bead. Necklaces of this kind are very much prized by the Navajo and are certainly very ornamental." The most accepted theory about the squash blossom design is that it symbolizes the Mexican pomegranate. The first decorations on Silver Navajo Jewelry were merely scratched in with a file. Later, a stronger tool was used to cut deeper lines. The technique of "punching" Silver was adapted from the Mexican tooling of leather. Any sharp-pointed piece of iron was used as a tool to punch dots into the Silver. The first stamps were made by cutting a piece of pipe in half to make the imprint of a semicircle. Don Lorenzo brought steel dies, or stamps, to Hubbell Trading Post later, but many smiths still made their own. The years from 1880 to 1900 have been called the Classic Period in Navajo Jewelry. The time of learning was over, but the tourists had not yet entered the scene. There were numerous smiths on the reservation, each making the items he wished to his own satisfaction. They used curved figures and lines in their designs, and most used carved dies which they made themselves. Many new, and much-improved, tools were available, such as tongs, pliers, cold chisels, punches, awls, vices, and dies. Since the use of U.S. coins had been declared illegal and the Mexicans had stopped exportation of pesos, most of the smiths fashioned their Silver ornaments from one-ounce squares of coin Silver. Brief History ofNavajo Jewelry Silversmithing, Arthur Woodward wrote: "It is my contention that all of these beads were originally Spanish-American trouser and jacket ornaments. . . . (The pomegranate) has been a favorite Spanish decorative motif for centuries . . . it seems foolish to look farther afield for prototypes of this highly popular necklace element. If one were to remove these buttons or cape ornaments from the original garments and string them, the result would be a fine 'old' Navajo necklace." The ornament was quite possibly misnamed by a trader who thought it resembled a squash blossom. Navajo Silver Jewelry had become a status symbol among the Navajos, the mark of wealth and prestige. The "pawn system" allowed them to pawn their Navajo Jewelry to traders in exchange for food and other necessities. The Navajo Jewelry was redeemed when the owner had the money, usually from selling a rug or the wool from newly sheared sheep. In the meantime, traders often allowed the owner to borrow the Jewelry for a ceremony or a fair, then return it the next day. Southwestern tribes had used shell and turquoise beads in necklaces and earrings for centuries, and the early Navajos wore these ornaments as well as turquoise nugget earrings. The nugget necklaces so popular among the Navajos probably evolved through the years. As turquoise became more available, it gradually replaced much of the shell. Adding turquoise to Silverwork was not a common practice until around 1900. Even then, one large stone was usually set into each classically simple piece. Other stones, used to a lesser extent, included garnet, peridot, opal, coral, smoky topaz, jasper, carnelian, chalcedony, agate, malachite, and jet, to name a few. None ever enjoyed the popularity of turquoise. In the early 1900s, the winds of change blew in with the coming of the railroad and the Fred Harvey Company, which established accommodations along the route. Tourism was introduced to Indian country, and tourists wanted Navajo Silver Jewelry. However, most of them neither knew nor cared anything about quality; they wanted inexpensive pieces adorned with garish designs, and shopkeepers were all too willing to please. Items made strictly for tourists began appearing: ashtrays, watch bracelets, letter openers, cigarette holders, and utensils. Larger companies began mass-producing Navajo "Indian" Jewelry; smaller shops hired both non-Indians and Indians from various tribes to machine-stamp cheap, tinny Silver with designs such as lightning, clouds, arrows, Indian heads, snakes, owls, swastikas, and thunderbirds, the last merely a figment of someone's imagination. Lists of what these figures supposedly symbolized were given to tourists. At that time, designs on authentic, handcrafted Navajo Jewelry were simply decorative. To quote Carl Rosnek in Skystone and Silver: "A great deal of nonsense was written or rumored concerning the 'meaning' of these symbols-when in fact, with few exceptions, they had none for the Indians." Much of the tourist Jewelry was made of nickel and decorated with small imitation-turquoise stones. Many of these items, sometimes referred to as "Route 66" Jewelry because of the proliferation of shops selling it along that highway, were stamped "nickel Silver." By 1937, laws were passed stating that only Indian-made Jewelry could be labeled as such, but circumvention became a favorite pastime. In 1940, the Japanese even went so far as to name a town "Reservation," so they could "legitimately" stamp Reservation Made onto manufactured Jewelry. In an effort to slow down the mass production of cheap imitation Indian Navajo Jewelry made in sweatshops (as they were commonly called), the government ordered that only handmade Jewelry could be sold at National Parks and Monuments, and some schools began teaching Silversmithing. However, these were troubled times and, with war looming on the horizon, the government had other concerns. In 1941 it did form the Navajo Arts and Crafts Guild to emphasize quality work and encourage the casting of Silver; consequently, the skills of many artists improved. The project had to be dropped during World War II, but the Navajo Tribe was allowed to take it over to make Navajo Jewelry. Despite the problems facing the world and the degradation of their craft during the early 1900s, there were many smiths who never lessened their standards. Superb craftsmen continued to set high-grade stones in quality Silver, and some excellent Navajo Jewelry of that period is considered classic. 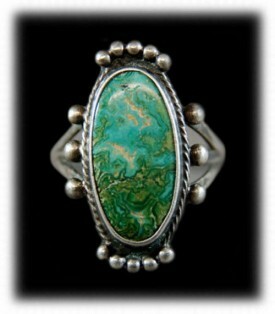 The use of turquoise had increased through the years, and a few jewelers began adopting the Zuni style of setting multiple stones close together in Silver. A larger piece of turquoise was surrounded by small stones, thus forming a cluster. This "cluster style" was a change for Navajo Silversmiths, but the Navajos have always accepted change-when it benefited them. Experimenting with new techniques and styles was a change they welcomed. Today American Indian Jewelry is some of the most popular and immitated jewelry in the world. Navajo Silverwork has also been the subject of substantial scholarly research. Readers interested in the various forms and stylistic changes of Navajo Jewelry are referred to the excellent studies by Margery Bedinger (1973), John Adair (1944), and Arthur Woodward (1971). Our present study is concerned with the economic implications of and technological changes in Navajo Jewelry Silversmithing. The Navajos were wearing Silver Jewelry obtained from the Spaniards by the late eighteenth century, and learned Silversmithing from them in about the mid-nineteenth century. Although many scholars have contended that the Navajos did not begin working in Silver until after Bosque Redondo it seems likely that they were learning the rudiments of the trade in the previous decade. However, the evolution of Silversmithing as an economically important craft did not take place until after 1865. In 1869, Edward Palmer, who led several expeditions from the Peabody Museum to the Southwest during the 1870s, wrote that the Navajos were making Silver buttons from Spanish and Mexican one real coins. According to Palmer, the buttons were used as money. A one real coin was worth 12 1/2 or eight to the dollar, and the buttons had the same value. Lack of proper tools limited the quality and variety of items produced by early Navajo Silversmiths. In 1871 the agency requested and presumably issued a small number of anvils, vises, hammers, files, file saws, and bellows to help Navajo blacksmiths, who usually worked as Silversmiths to make Navajo Jewelry as well. During the 1870s, the quality of Navajo Jewelry and Silverwork improved as smiths acquired a wider variety of tools from traders and learned to make tools themselves. Matthews noted in the early 1880s that Navajo smiths purchased scissors, iron pliers, hammers, awls, emery paper, fine files, and borax for soldering from local traders. They had also learned to make goatskin bellows, anvils, dies and bolts, sandstone molds for casting, tongs, and brass blowpipes. As their equipment improved, the Silversmiths could produce a greater variety of items. By the early 1900s, they were making buttons, rosettes, bracelets, bridle ornaments, and concha belts. Three or four of the smiths were fashioning canteen-shaped tobacco cases. 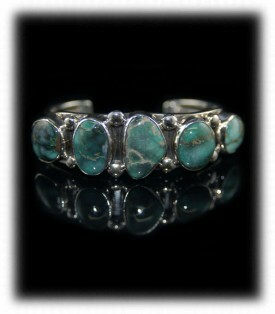 About 1880, some of the smiths in the Ganado area started to make Navajo Jewelry with turquoise sets. Silversmithing flourished during the 1880s, when the Navajos prospered and began investing their wealth in Silver Jewelry. In 1880, when Navajo employees of the agency were asking for their pay in Mexican coins Manuelito decided to make bridles out of Silver money. Navajo Silversmiths were finding a ready market for their work among their own tribesmen, and a profitable trade in Navajo Jewelry was evolving with local whites and members of other tribes. The development of the pawn system during the 1880s further encouraged Silversmithing. Silver ornaments, no matter what kind, all Navajo Jewelry could be pawned to traders in exchange for other goods. The pawn system expanded the function of Navajo Silver Jewelry from personal adornment to "savings" which could be used during times of economic crisis. Bedinger thought that Silversmithing probably started in the Ganado area, and noted that most of the "pioneer" Navajo Silversmiths lived within twenty-five to forty miles of Ganado. The number of smiths making Navajo Jewelry rapidly increased during this period, and by 1900 Silversmiths lived throughout Navajo country Nevertheless, in terms of technique, design, and skill, the Ganado smiths continued to excel. We invite you to also read our informational page on Navajo History, check it out! We have included links to the Navajo Jewelry product presentation pages if you would like to read more and see additional photos on any of the pieces below. Above are two Navajo Rings, both have Turquoise Stones and are good examples of Navajo Jewelry. The Silver Ring on the left was made aproximately 1930 and the Navajo Ring on the right was made in 2011. Navajo Jewelry is some of the most unique handmade Silver Jewelry in the world. 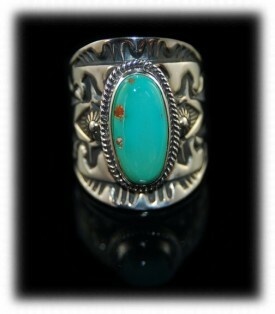 To the left is a great old Navajo Ring, most likely coin Silver with a Nevada Turquoise stone. Notice the drops of Silver which is the main design of the ring. To the right is a modern day Navajo Silver Stamped Ring, also with a Turquoise stone the main difference is the ring on the right has profuse stampwork that was done with tools that many Navajos did not have in the earilier years. See more American Indian Rings. To the left is a Bisbee Turquoise Row Bracelet and a classic design for Navajo Jewelry. Bisbee Turquoise was available from the late 1950's until the early 1970's and this is generally what dates Navajo Jewelry items such as this bracelet. You can see more bracelets like this in our American Indian Bracelets page. To the right is a Navajo Row Bracelet that was produced for Durango Silver Company. This bracelet features five Damele Turquoise gemstones in a row which is why it is called a Navajo Row Bracelet. 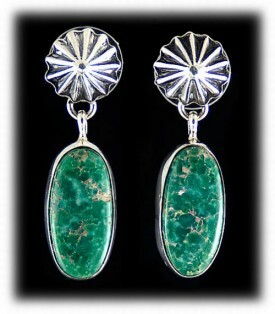 To the left is a pair of Navajo handmade Turquoise Dangle Earrings with green Nevada Turquoise stones. They dangle from handmade Silver buttons that were made with a dapping die, The Navajo cut Silver circles and then pounded them into a fluted recess in a steel block. To the right is a pair of Navajo Silver Earrings with Sleeping Beauty Turquoise and filigree Silver work. 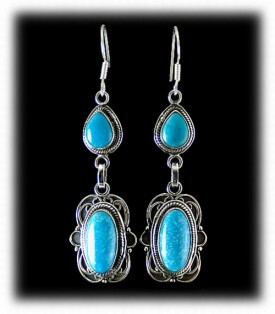 These are Turquoise Dangle Earrings which are quite popular in the Southwest and collectible by individuals worldwide. To the left is a modern day Navajo Squash Blossom style necklace made with Manassa Turquoise from Colorado. Manassa Turquoise was one of the first Turquoise deposits found by the Native American Indians over 2000 years ago. You can still find Navajo Jewelry with Manassa Turquoise, however, the Manassa Turquoise Mine hasn't been producing substancial amounts of Turquoise for over ten years. To the right is an Old Navajo Concho Buckle with typical Navajo Silver Stamp work and old Turquoise stones. 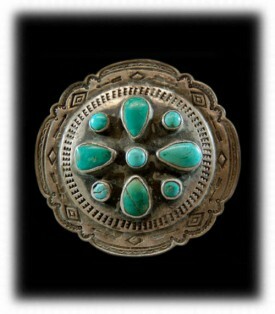 Antique Turquoise Jewelry as well as Vintage Turquoise Jewelry has become difficult to find and expensive when you do. Navajo Jewelry, old as well as new is a great investment as Silver is slated to escalate dramatically and Turquoise Mining has nearly come to a halt, worldwide. We hope you have enjoyed our presentation on Navajo Jewelry and have gained some useful knowledge from it. We invite you to learn more about Turquoise and Navajo Turquoise Jewelry by following the links in our Learning Center to other informational pages that we have written on different topics related to Turquoise Jewelry. In addition, we would like to invite you to join our E-Mail Newsletter - about once every other month we send out a Newsletter to inform our members of what's happening with Durango Silver Company, new products, specials for our members and more. We also have a monthly drawing from our member base to give away free Turquoise Jewelry from our company. Please take a moment to become one of our friends by signing in below. 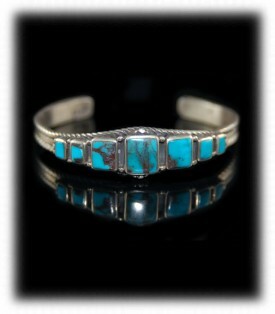 We hope you will think of Durango Silver Company when looking for Navajo Jewelry.